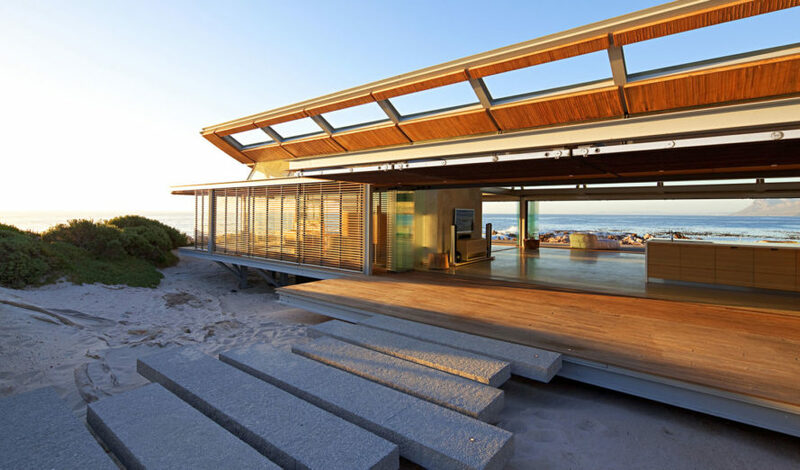 The spacious Rooiels Beach House near Cape Town in South Africa can function as an introverted retreat or an open, daylit space that embraces its remarkable seaside location. 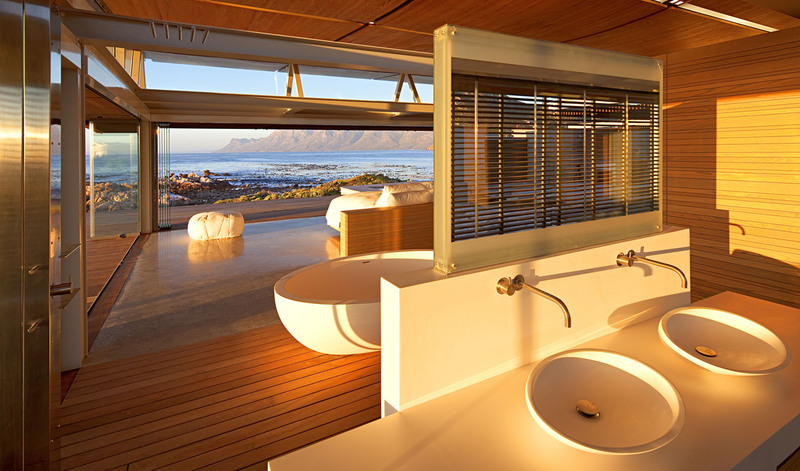 Elphick Proome Architects designed the building for a South African businessman, creating a single space vacation home with a powerful hydraulic system of shutters that control privacy and natural light. The house comprises a minimalist steel-framed glass box with a hull-shaped hardwood roof and glass walls that run continuously along the perimeter of the building. Sitting on a small promontory overlooking a sensitive ecosystem of fynbos vegetation and dunes, the building has a minimal impact on its surroundings. The interior doesn’t have any fixed partitions. All interior walls are sliding ash-clad doors that allow natural light to reach the interior during the day and create an open space that extends out onto cantilevered hardwood decks. The line between private and public spaces is blurred, while steel, glass, raw concrete and wood create subtle contrasting elements. The house is a minimalist steel framed glass box with a hull-shaped, hardwood roof, and glass walls that run continuously along the perimeter of the building. Sitting on a small promontory, over a sensitive ecosystem of fynbos vegetation and dunes, the building has a minimal impact on its surroundings. The interior doesn't have any fixed partitions. All interior walls are sliding ash clad doors that allow natural light to reach the interior during the day, and create an open space that extends out onto cantilevered hardwood decks. The line between private and public spaces is blurred, while steel, glass, raw concrete and wood create subtle contrasting elements.